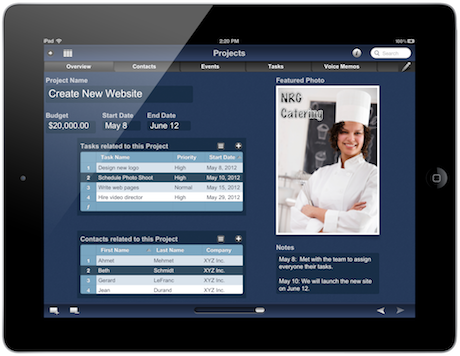 FileMaker on Tuesday introduced Bento 4 for iPad, a new version of the personal database software. The new version of Bento is normally priced at $9.99, but has been discounted to $4.99 as a special promotion until August 1st. The new release makes it easier than ever to create new databases by including 25 built-in templates especially designed for iOS. 40 themes are included which provide coordinated backgrounds, fonts and shading for custom database creation. And access to FileMaker’s online “Bento Template Exchange” is now integrated, making it easier to find templates that other users have created. The Exchange currently hosts more than 1,000 free templates from Bento and FileMaker users. New methods of displaying data have been added, including the spreadsheet-style Table View, which can include calculations, Split View and Full Screen view. Encrypted fields are now supported, so you can add passwords, account numbers and other sensitive information which can be locked down using a password. GPS location can also be added as a field as well. Other new features include highlighted search results, a record slider, and the ability to sort on multiple fields. Bento 4 for iPad can also be synchronized using Bento 4.1 for Mac (released as a free compatibility update). FileMaker has also discounted Bento 4.1 for Mac to $29.99, down from $49.99. It’s available from the Mac App Store and FileMaker’s Web site.